When Samuel Doty put in to Mirligueche Bay in Nova Scotia for water on 25 August 1726, everything still seemed to be going according to plan. Doty, the master of the sloop Tryal, had likely been cautious and concerned when he sailed from Massachusetts on a fishing voyage earlier that month. After all, the four-year-long war between the English on one hand and Northern New England and Nova Scotia’s original inhabitants on the other had only ended the previous December, and the peace had been ratified in Annapolis Royal barely two months before Doty arrived in the province. Fishing vessels such as the Tryal were fair game during war, and a great many Wabanaki were skilled mariners who time and again had shown their willingness and ability to take English ships during times of both declared and undeclared hostilities. So when Doty and his crew spied several people on the shore near the site of a Mi’kmaw village close to modern Lunenburg, his feelings were doubtless mixed. Still, however, things seemed to be going well. He felt comfortable enough to hail the people on shore, and invite the two Acadian men present—but not those he identified as Mi’kmaq—to come aboard for drinks and an exchange of news. Those Acadians were Jean-Baptiste Guedry dit Laverdure, and his thirteen-year-old son and namesake, Jean-Baptiste fils. They, too, were watching the situation unfold cautiously. But their reasons were quite different from Doty’s: they, along with Laverdure’s Mi’kmaw brothers-in-law James and Philippe Meuse, had resolved to take Doty’s ship and men captive—by whatever force necessary. Within a few hours, Doty and his crew were prisoners on their own ship. While the conspirator’s methods were similar to those of pirates sailing the eighteenth-century ocean world from India to the Spanish Main, their motivations were regional and personal. Doty and some of his crew were to be held as prisoners in Mirligueche to ensure the return of Guedry’s son Paul, and James and Philippe’s brother François, who had been captured by the English during the war and were still held at Boston. This was not the first time that members of the extended Guedry-Meuse clan had experienced captivity in New England. During the height of the war, Laverdure’s brother Augustin and sister-in-law Jeanne Hebert had been held for at least several months in Boston, where Jeanne had given birth to twins. But Guedry and the Meuse brothers’ plans, too, were not to be. In a dramatic reversal of fortune, Doty and his crew were able to overcome their mostly Native captors the next morning, taking advantage of the pirates’ over-enjoyment of the ship’s rum stores the night before. At the end of the brief skirmish, three Mi’kmaw men had jumped overboard, later to be rescued by a passing French ship, while Jean-Baptiste père had to be fished out of a life boat. The Guedrys, the Meuse brothers, and a young Mi’kmaw man named John Missel were taken back to Boston and put on trial, no doubt spending time in the same jail where their family members had been—or still were—held. All five were found guilty of piracy and hanged. The trial proceedings were swiftly printed as The Trials of Five Persons for Piracy, Felony, and Robbery and consumed by a Boston audience eager for stories of justice done to pirates and news of the safety of an important fishing site. 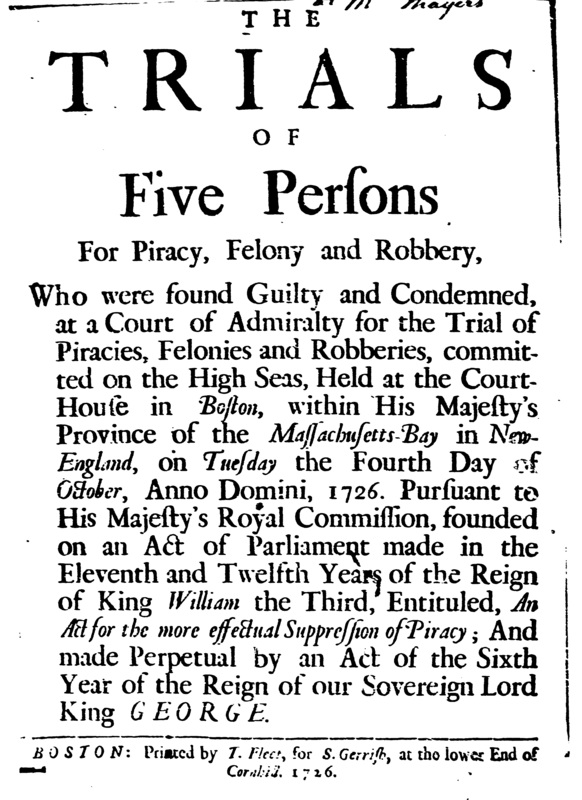 The Trials of Five Persons for Piracy, Felony and Robery (Boston, 1726). American Antiquarian Society, via Readex. The story of the Tryal is a gripping one. It has all the elements of a good yarn: high-seas violence, captive loved ones, and dramatic plot twists, all set against the dramatic beauty of Nova Scotia’s south shore. As an incident of intense intercultural contact, it is also compelling for historians. William Wicken, for example, has used it to talk about relationships between New England fishermen and the Mi’kmaw communities they interacted with along Nova Scotia’s Atlantic coast. Geoffrey Plank has discussed the trial for what it says about efforts to separate Acadians and Mi’kmaq within the province, as the ethnically mixed members of the Guedry-Meuse family were sorted into categories of “French” and “Indian.” But I suspect that this story might also have something to tell us about how we as historians can understand dynamics in the greater Gulf of Maine region in the era before the erection of an international border. Both “sides” in this encounter were multicultural and multiethnic. Doty’s crew, for example, consisted not only of English-descended white New Englanders, but at least one Native man from the Cape Cod region, Philip Sachimus. It is therefore not accurate to consider this simply an encounter between the English and French, or even between natives and newcomers. The events of August 1726 also did not involve crossing between empires. Still, both sides clearly recognized a significant regional difference, one defined, in this case, by the threat and location of captivity. While Doty’s men doubtless had various and potentially fraught relations with Boston, it was nevertheless their home base and a potential source of justice; for the Guedry and Meuse families, as well as Missel, it was just a place of imprisonment. Similarly, fishermen and others—particularly soldiers—who crossed into Nova Scotia’s waters recognized that captivity was a real risk. Nova Scotia as a place of perceived danger for New Englanders continued even into the Planter period, when ships of settlers were accompanied by an armed guard, and was interestingly reversed in the years of the American Revolution, when Massachusetts privateers stalked Nova Scotian waters. The threat of imprisonment of course was not the only thing that made Nova Scotia different from New England. Politics, geography, and Native power all played key roles in defining difference in the years before and after the creation of an international border. But how might things look different if we made danger, fear, and the risk of captivity central to the story? The events of the two days can be found in The Trials of Five Persons for Piracy, Felony, and Robbery (Boston, 1726). Although Nova Scotia is far from the best term to describe the region during these years—for most it remained either Mi’kma’ki or Acadie—I have chosen to use it in this post for the sake of clarity for modern readers. See Matthew R. Bahar, “People of the Dawn, People of the Door: Indian Pirates and the Violent Theft of an Atlantic World,” The Journal of American History 101, no. 2 (September 2014): 401–26. Most Acadian and Wabanaki captives brought to Boston seem to have been held—at least initially—at the Boston jail, although some were put out to individual households. See, for example, Boston Jail Records for 1696-7, Massachusetts Archives Collection, vol.40 p.448-469, Massachusetts State Archives, Boston; Petition of Jonathan Ting, 26 May 1697, Massachusetts Archives Collection, vol.30 p.426, Massachusetts State Archives, Boston. William Wicken, “26 August 1726: A Case Study in Mi’kmaq-New England Relations in the Early 18th Century,” Acadiensis 23, no. 1 (Autumn/Automne 1993): 5–22. Geoffrey Gilbert Plank, An Unsettled Conquest: The British Campaign against the Peoples of Acadia, Early American Studies (Philadelphia: University of Pennsylvania Press, 2001), 81–83. At one point in the Five Person pamphlet, reference is made to another Native crew member aboard the Tryal, but this may be an error. This is not to downplay the recent scholarship which has shown the myriad ways in which the conquest of Nova Scotia was very much a work-in-progress rather than a fait d’accompli in these years. See, e.g., John G Reid et al., The “Conquest” of Acadia, 1710: Imperial, Colonial, and Aboriginal Constructions (Toronto: University of Toronto Press, 2004). For Planter settlers with armed gaurds, see 27 April 1760, The Boston Evening-Post, 3 and 26 May 1760, The Boston Evening-Post, 2. Any more information about Philip Sachimus, the Cape Cod aboriginal? I did some poking around when I was at the Massachusetts State Archives last summer trying to find out more about Sachimus but wasn’t able to turn up anything on him, unfortunately! Would love any leads if anyone has them. The person you’re looking for is not a Sachimus by name but by vocation ! Sachimus in the Algonquin language simply means “Chief” ! So you’d be looking for a “Chief” named Philip ! Nauset Wampanoag Tribe in the Cape Cod area, now known as Mashpee Wampanoag ! if you have any dates that would help ! and a list of Indian Chiefs from Cape Cod named Philip should be easy !